Let me just start by saying - there is no right way to meditate. In fact when someone asks me how to get started, this book is the first place I point them to. There are a LOT of different ways at it out there, it ranges from chanting and singing, to laughter meditation, to noise baths, to people who sit in absolute silence on mountains for days at a time - yes that is a real thing that people do. I have been developing my own meditation practice for more than 10 years and it’s been invaluable to me during that time. I do not claim whatsoever to be an expert, or to be perfect at doing it every day. I have days that it comes easily, and days that it can feel like the weather of the world and my internal mind are insurmountably uncooperative. Perhaps if I hadn’t had beginner’s luck in my first attempt at it I might not have stuck it out with trying to reproduce the experience. I personally came to meditation through physical yoga asana practice, the major goal of which is to exercise the body so you won’t feel it when you meditate at the end of the session. The first time I tried it, I was experiencing chronic pain from undiagnosed celiac disease. Not knowing how else to help, a friend who had just returned from study at an ashram in India invited me to take a class with her. We did the simplest of beginner Hatha practices in an empty room with no cushions, or blocks, just matts and ourselves. After stretching and twisting out all of the tension she lead a guided relaxation I was able to drop into a space of deep calm. My thoughts went quiet and the chronic pain I was experiencing momentarily went away. Anyone who has ever experienced chronic pain will understand, this felt nothing short of a miracle. Since that incredible experience I have tried several different approaches to meditation, some of which worked, some of which did not. Along the way I found Zen classes through New York Open Center, yoga practice through the Sivananda Center and learned different styles through the many wonderful practitioners at Maha Rose in Brooklyn. Taking parts and pieces from each of these styles has helped me learn what works for me and what doesn’t. When starting out, I would highly recommend taking a class or two to see what works for you. New York City dwellers have access to MNDFL a chain of spaces for urban dwellers to take classes and come together for practice. If you don’t live close to a center or can’t seem to make it to one, apps like Headspace or Insight Timer are great places to start and good tools to use in daily practice. No matter how you get started, the key to experiencing the effects of meditation is regular practice - everyday for whatever period of time you can make available. It’s a well explored social psychology concept that the less choices you have to make to make to do an activity the more likely you will be to take that action. In The Paradox of Choice: Why More is Less, Barry Schwartz explains why too many choices is antithetical to decision-making. Creating a habit is much easier when we can cut out the how, when, where and why of it. The further you can automate your habit the less you will activate your thinking mind around the act of meditating which will condition the mind to slow down more quickly. Start by selecting a regular time in your routine, ideally you should choose a time where your mind is less occupied by everyday concerns. For me this is first thing in the morning before I’ve checked my email or had any conversations. Choosing the space is equally important. It’s ideal for the space you choose to be dedicated to the activity of meditating. A dedicated space helps with eliminating the problem of choosing between meditating or other tasks you may do in that same space like checking e-mail or folding the laundry. If like most of us urban dwellers out there, your small space lifestyle doesn’t allow you to have a designated room, a corner of a room will do. If finding solitude is an issue, explain to your family members or roommates to give you some dedicated quiet time or invite them to participate in your practice. If you have little ones there are good meditation books for children out like Peaceful Piggy by Kerry Lee MacLean that can help you create a habit together. When choosing the place you will use there are certain Feng Shui/Vastu based principles that can help you select the right area. The time of day will inform your choice: For example if you choose to mediate in the morning, the Eastern or Southeastern part of your home will have better energy from the early morning sun. Additionally choosing a place where you can be in the “command position” is important. At the most basic level, this means having a good strong wall behind your back with no windows or doors. This will help you avoid mentally “watching your back” by surveying for sounds or noises from the scene that you can’t see. As you repeatedly use your space for the task of meditation it will naturally build up an atmosphere that will help still your mind. When getting started, the area may remind you of your work or tasks, or cause you to think about your relationship with others who use that space. If like I do, you believe that space holds energy, I recommend making an effort to clear it out. Clean up and tuck away anything that reminds you of a negative distraction. Smudge sticks like these ones from Maha Rose are a way to clear energy from a space. Skeptical? Read this explanation from the Numinous to of understand the history of smudging and how it works. Many meditation practices rely on breathing exercises that force you to pay attention to your breath to become more present. Since this is such a deliberate area for attentive full breathing, try to make it a healthy zone. Pay special attention to keep the air in this area free from toxins and allergens by choosing furniture and finishes in that area that are don’t have VOC’s strong smells. Fragrance is one of the easiest ways to cue a memory or state of mind. Make sure any fragrances you do use are made with natural essential oils rather than with endocrine disrupting synthetic smells. I love the meditation candles from Species by the Thousands as an extra way to help me focus. Adding plants is another way you can create a healthy happy ambiance and purify the air in your meditation nook. The physicality or lack of physicality of meditation can be a key ingredient of creating an environment within the body to achieving a state of relaxation. Different schools and styles may call for a different position or posture there are a few overarching themes. The most important thing is to find a posture that gives a straight spine, and will simultaneously lend itself to relaxation while not causing you to fall asleep. 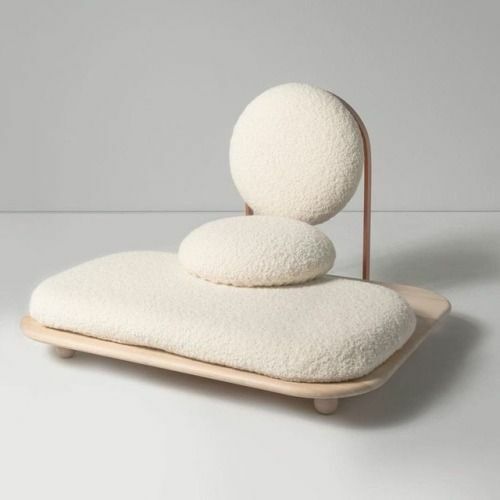 There are a number of designers who have developed beautiful products to serve the purpose of achieving a posture that will help us not to feel our body and dive into a deeper awareness. You don’t need fancy cushions or a fancy chair, but they can’t hurt either. Some of my favorite products include the stacks bench created by Leah Ring of Another Human Design. This design offers a flexible furniture solution to be used either as luxe meditation stones or impromptu seating arrangements for guests. The ginkgo floor and meditation seat by Ariel Lynne with it’s compact simplicity and biophilic design concept also caught my attention. It is sculpted from wood to form to the user’s body and integrates a handle for easy portability. 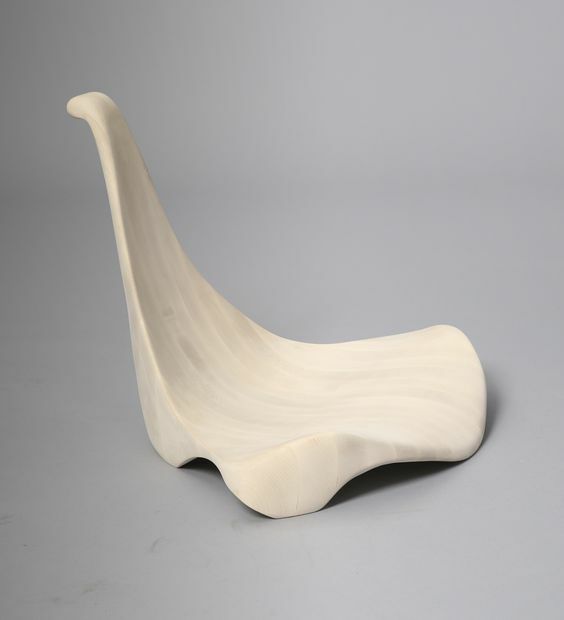 The Asana Chair by Mario Milana helps to achieve physical and mental balance while "bringing you closer to the earth". Whether you choose a special chair or cushion to connect to your practice, lay on a simple mat on the floor or just sit in a good old dining chair - taking a moment to remember that the big wide world is holding us with her gravity all day every day, is pretty darn cool thing to contemplate.